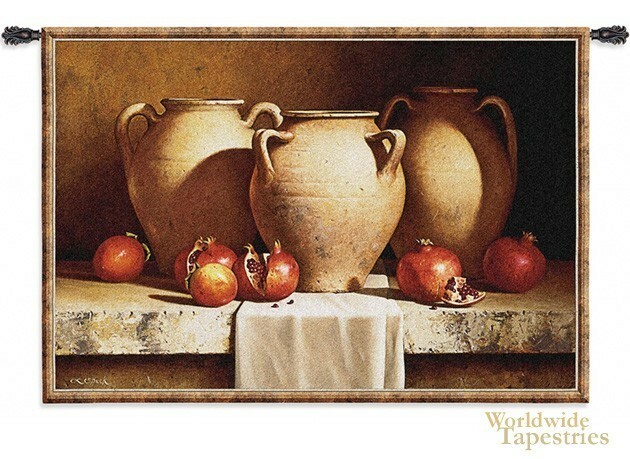 Drawing his inspiration from the still lifes of the Renaissance, California born artist Loran Speck’s Urns with pomegranates stands up well to the works of the Dutch Masters. In fact, many art collectors consider Speck’s work to be on a par with those of Rembrandt and Rubens. The incredible detail of Urns with pomegranates is sight to behold. The careful use of shadowing and light as well as the exquisite rendering of the surface of the urns make it look almost as if it is a photo. Speck’s art has been a fixture of Carmel-by-the-Sea in California for the last 25 years. And now, with this wonderful tapestry, his work can grace your home as well. Urns with Pomegranates comes with a tunnel for easy hanging. Note: tapestry rod and accessories, where pictured, are not included in the price. Dimensions: W 77" x H 53"